Whipping up a pudding pie and red velvets today, Valentines. xoxo! This is the best pudding pie ever, with just a couple tweaks from the original bon appetit January 2008 recipe. Don’t bother buying fancy pre-made crème fraiîche; it’s inexpensive and easy to make your own: just combine 2 tablespoons buttermilk with 1 cup of heavy whipping cream in a glass container, cover, and let sit 12-24 hours (until it thickens to the consistency of yogurt). Stir well and chill in the fridge for up to 8 days. CRUST: Position rack in center of oven; preheat to 350°F. Blend cookie crumbs and sugar in processor. Add melted butter; process until crumbs are evenly moistened. Press crumb mixture onto bottom and up sides (not rim) of 9-inch-diameter pie dish. Bake until crust begins to set and no longer looks moist, pressing gently with back of fork if crust puffs, about 12 minutes. Remove crust from oven, then sprinkle chopped chocolate over bottom of crust. Let stand until chocolate softens, 1 to 2 minutes. Using small rubber spatula, gently spread chocolate over bottom and up sides of crust to cover. Chill crust until chocolate sets, about 30 minutes. FILLING: Whisk sugar, cocoa, cornstarch, and salt to combine in heavy medium saucepan. Gradually add 1/3 cup milk, whisking until smooth paste forms. Whisk in remaining milk, then 1/4 cup cream. Using wooden spoon or heatproof spatula, stir mixture constantly over medium heat, scraping bottom and sides of pan until pudding thickens and begins to bubble at edges, about 5 minutes. Add chocolate; stir until mixture is smooth. Remove from heat; stir in rum and vanilla. Pour hot pudding into crust and spread evenly. Cool 1 hour at room temperature. Cover with plastic wrap; chill overnight. DO AHEAD Can be made 2 days ahead. Keep refrigerated. TOPPING: Using electric mixer, beat crème fraiîche, whipping cream, sugar, and vanilla in medium bowl just until stiff peaks form and mixture is thick enough to spread (do not overbeat or mixture may curdle). Spread topping decoratively over top of pie, swirling to create peaks. DO AHEAD Pie can be made 6 hours ahead. Cover with cake dome and refrigerate. Create chocolate shavings using a shaver or grater. 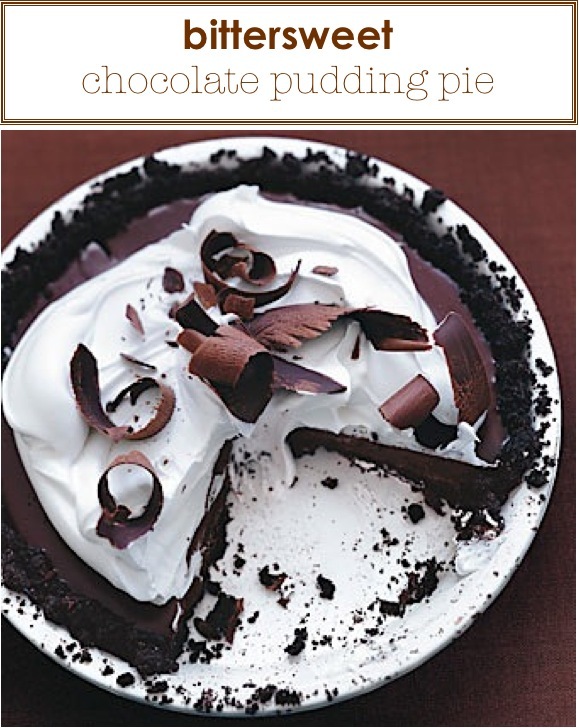 Sprinkle chocolate shavings decoratively atop pie. Cut pie into wedges and serve. 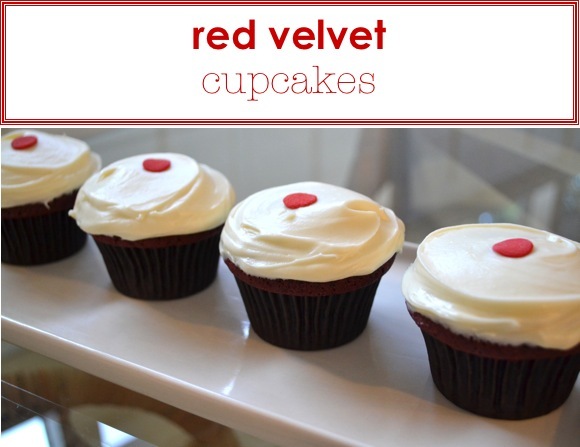 These are the best red velvet cupcakes. An all-natural cake mix base makes this recipe easy and keeps the artificial red food coloring out of your kitchen. Love Sof’ella mixes — an L.A. based gourmet food company that specializes in all natural sweets. You can find their red velvet mix at Cost Plus World Market stores or here. CAKE: Prepare cupcake batter according to package directions, combining the unsweetened cocoa to the batter as the last step before pouring batter into cupcake molds. Bake as directed. Let cool completely before frosting. FROSTING: In a large bowl, combine 3/4 cup of the Vanilla Bean Frosting Mix with the confectioners sugar. Set aside. In the bowl of an electric mixer fitted with a flat beater, beat butter, cream cheese, and salt on medium speed until smooth and creamy. Using low speed, gradually add the frosting/sugar mix until incorporated. Do not overbeat – the frosting should be dense and creamy. TOPPING: Place a candy dot or heart on each frosted cake.